Confession... I don't like shrimp. Actually, any kind of shellfish for that matter, but I know many people who do, including my husband. However, the tasty marinade and honey butter, used for basting, changed my mind and even I enjoyed this succulent shrimp entrée. Add a side of cool, homemade, creamy cole slaw and you have yourself a magnificent meal! In a large bowl, mix together garlic powder, pepper, Worcestershire sauce, wine, and Italian seasoning. Add shrimp and toss to coat. Let marinate for 30 min. to one hour. Preheat grill for high heat. 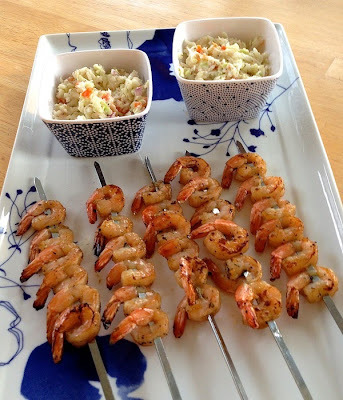 Thread shrimp onto skewers. Discard marinade. In a small bowl, stir together honey and melted butter. Set aside for basting. Lightly oil grill grate. Grill shrimp for 2 to 3 minutes per side. Baste occasionally with the honey-butter sauce while grilling. Remove from grill and enjoy! If you'd like a printer-friendly version of this recipe, Click Here. Combine the shredded cabbage and carrots in a large bowl. Whisk together the mayonnaise, sour cream, Splenda, vinegar, mustard, celery seed, salt and pepper in a medium bowl, and then add the cabbage mixture. Mix well to combine and taste for seasoning. Enjoy!